Linfield manager David Healy has hailed the impact made by young striker Paul Smyth after the teenager scored in the 2-1 Boxing Day win over Glentoran. "Paul was excellent through a turbulent time for the team in November. He has been one of our shining stars and his goal was just reward," said Healy. "I told Paul to go out and make a name for himself in a big game in front of a huge crowd and that is what he did. "Hopefully in years to come we will all be talking about this young boy." Smyth, 18, broke into the first team at Windsor Park following Healy's appointment as successor to previous boss Warren Feeney, and has put together an impressive run of form. "We don't want to build him up too much but he gives us energy and a wee bit of class - he could have a big future ahead of him," added the former Northern Ireland international. 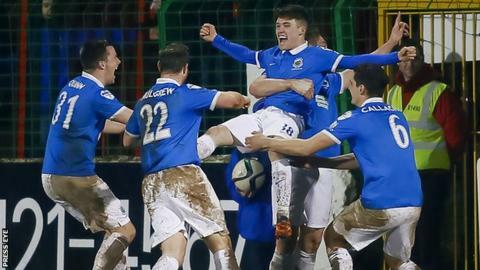 Linfield lost all four of their Premiership matches in November, but reversed that trend with four wins and a draw in all competitions during the month of December. The Blues lie third in the league table, nine points behind leaders Crusaders, ahead of the meeting between the two sides at Windsor Park in the pick of the fixtures on New Year's Day. "We will concentrate on ourselves and I believe if we turn up with the same attitude of togetherness we can win the game on Friday," argued Healy. "Everyone knows our record against the Crues has not been good in recent years but I have full confidence in my players and sense a renewed pride in wearing the shirt among the boys."